It goes almost without saying: The father of San Bernadino terrorist Syed Farook has told the Italian newspaper La Stampa that his son was 'negatively obsessed' with Israel. 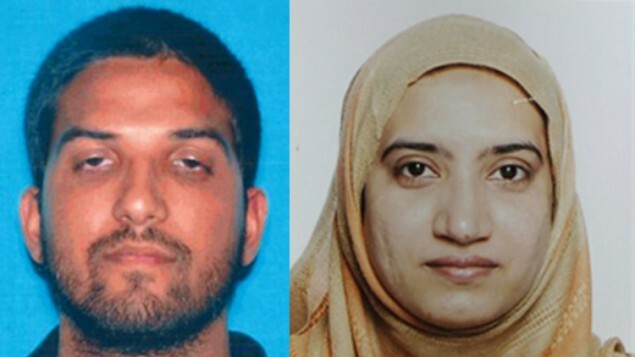 Farook’s son is suspected of carrying out a mass shooting that killed 14 people in San Bernardino. The father was interviewed in Corona, California, where he lives with his older son, Syed Raheel Farook, a US Navy veteran. Farook senior was born in Pakistan and arrived in the US in 1973. The family has been described by many as very integrated in American society, almost the embodiment of the American dream. Other reports told a more nuanced story: Farook split from his wife Rafia, also Pakistan-born, who filed for divorce in 2006 and, according to The New York Times, said her husband was violent and an alcoholic and beat her and the children. What nice people. Why were they ever admitted to the US in the first place? Because in 1973, no one suspected anything. But isn't it amazing how Muslim terrorists are also always obsessed with Israel? It starts with the Jews but it never ends with the Jews. Think about it: This 'lovely' couple abandoned their 6-month old child, and then went out and murdered 14 people that they knew. Does anyone really believe that this is about the 'Palestinians'? Uh. Many women when they file for divorce claim they are abused. The lawyers tell them to do this. I mean it was the mother that was living with them while they were stock piling weapons and she said nothing. Let us not make her the victim here. Please!! It is another aspect of suicidal men in that they live with unstable mothers and the father is emotionally absent and the mothers don't care if the male son kills himself That is the feminist dream. The Boston Bomber also was from a divorced family with an unstable mother. Don't turn the mother into a victim here. She is as much to blame as anyone. The mother was living with them while they were stock piling weapons. To make her a victim is missing part of the story. Some women when filing for divorce make the claim they are abused but that doesn't mean it is true. Lawyers tell them to do this as well. Why didn't the mother say anything. This abused women so her son stock piling weapons. I mean come on. Don't make her the victim here. Notice a lot of these men who are suicidal have unstable mothers and no father around. Some don't think it is relevant but I certainly think it is and the terrorists take advantage of disturbed men who are suicidal in the first place and men with no father around seem to have much higher rates of being suicidal.